I found this poem on my cousin's blog. It sounded familiar to me, but I couldn't quite place it. Then my mom showed me this, that she made when I was a baby. I have it hanging in Anna's room and I love it. My house is by no means always clean, but I spend a lot of energy fretting about it. 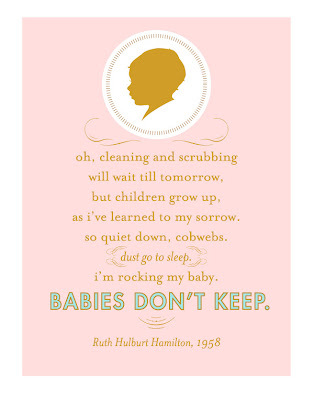 This is a good reminder to calm down and enjoy the fleeting time I have with my newborn. I LOVE this! 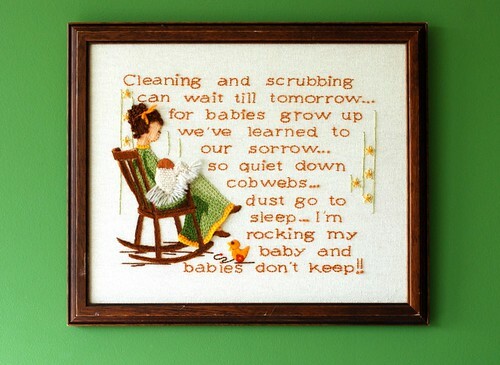 I seriously wish I had one of those cute little poems embroidered and hanging on my wall! You think there is any chance your mom and Colleen did that project together? My friend Julie has the exact same embroidery from when she was little! I love the message, too. I remember when your mom did that, Al! I have always loved that saying. It is an important sentiment. Very important! And no, I didn't do one too. Drat! It is so cute. I made one when Ryan was a baby! It is so true! I really love this and I think I'll steal it and put it up, not to remind myself not to clean, but to remind Justin that this is why I don't clean. I have, however been in a cleaning stint ever since I got my place ready to sell and majorly de-cluttered my house and deep cleaned everything, including walls, window treatments and cobwebs in the highest corners and I have to say I really liked having a super clean house. We sold the place in a week and now I'm back to my old self, but now I'm getting excited(even more than before) to get a house cleaner! lol!